Pickering resident Raimund Zyvatkauskas is the winner of a brand new Harley-Davidson motorcycle. Purchased at the Toronto Motorcycle Show, his ticket was among 5,000 sold to benefit Special Olympics Ontario. 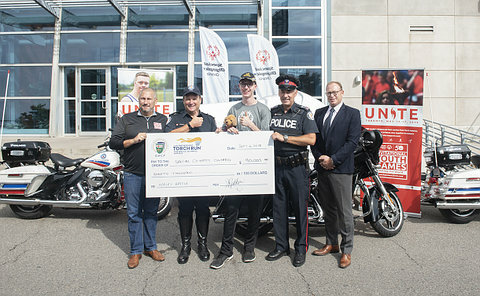 A total of $90,000 was raised from this year’s event that will go towards the Special Olympics Ontario World Invitational Youth Games in Toronto next May. Toronto Police Service is the official Games’ host. The raffle was organized by Traffic Services in conjunction with the Great Lakes Police Motorcycle Training Seminar. Prior to this year, Traffic Services sold 2,500 tickets annually. The 2018 Harley-Davidson 93 horsepower Street Glide is equipped with the new Milwaukee 107 engine. The price tag is $27,000. Special Olympian Callum Denault, who started swimming before moving into basketball and track & field, drew the winning ticket. “I am honoured to be asked to do this and it’s quite exciting to have the World Games in Toronto,” he said. A total of 2,500 athletes from around the world will take part in the World Games from May 14-17. The Games budget is $5 million. 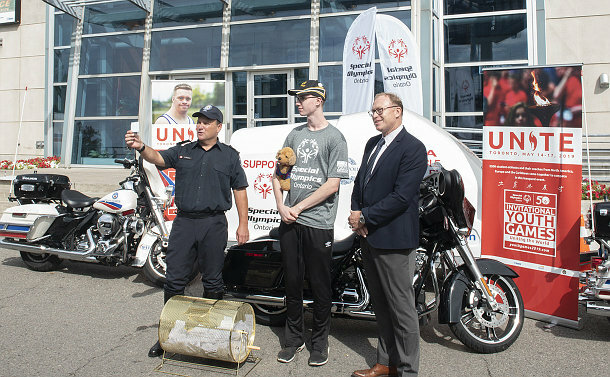 Cody Jansma, the Ontario Law Enforcement Torch Run business development director, said the money raised through the raffle is a big boost for the Games. Retired Chief Jack Marks and Constable Lorne White organized the inaugural Torch Run in Canada, in 1987, that brought together runners from 36 law enforcement agencies. They covered nearly 900 kilometres before lighting the flame at Varsity Arena to kick off the International Floor Hockey tournament.